In these times when foods more than nutrients are filled up with chemicals, we must look out for better choices. That’s where Superfoods come into play. Just like Spirulina, there’s another blue-green alga, Chlorella, that has been recognized as a superfood. So what does this chlorella actually contain for which it is all over the health radar? First of all, it is proven that Chlorella is supremely blessed with various nutrients. Wondering how to utilize the goodness of superfoods to the maximum through diet? Get a FREE consultation from a Truweight Nutritionist today! Click here. Chlorella is rich in amino acids, potassium, phosphorus as well as biotin. It naturally increases oxygen uptake in the blood as well as acts as a great detoxifier of heavy metals from the human Healthbody. There are different scientifically proven health benefits of chlorella and we bring to you 6 of the most amazing ones. A high level of cholesterol is one of the major contributors to cardiac diseases. And studies have found that daily consumption of Chlorella supplements can reduce the level of serum cholesterol. Chlorella clears reduces cholesterol by removing it from the digestive tract and also preventing its reabsorption. Chlorella contains nutrients that are related to lowering of cholesterol. It contains fiber that reduces the bad cholesterol as well as the overall cholesterol by eliminating cholesterol particles. Also, it contains antioxidants that reduce heart issues by preventing the oxidation of LDL. 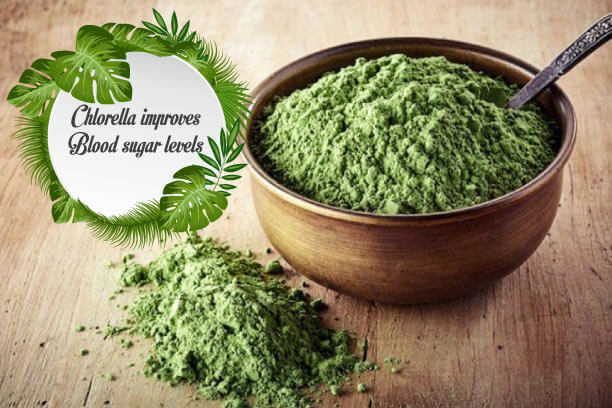 Chlorella contains certain nutrients that can be beneficial for sugar levels in the blood. It contains magnesium  that is found to be effective in improving blood sugar levels. Moreover, it is also found that consumption of chlorella helps in activating genes that improve insulin sensitivity within cells. Studies have proven that chlorella can be effective in improving the immune system. Moreover, it contains anti-inflammatory properties that keep the overall health intact. In another study, Researchers from Yonsei University in Korea did an experiment on healthy people who were divided into two groups with one being given 5 grams a day of chlorella. b) An increase of immune providing proteins in the body. Do you get tired very easily? Well, chlorella supplements will help you. Studies show that chlorella consumption helps in increasing the energy levels by significantly increasing the oxygen uptake in the body . Hence, it is definitely a source of natural body revitalizer. Another very important and popular use of this superfood is that it can greatly help in weight loss. Studies have shown that chlorella reduces body fat percentages, fasting glucose levels as well as cholesterol levels that help in weight loss. Moreover, it is also found that Chlorella helps in fighting obesity by improving insulin resistance in the body. Also, chlorella fulfils nutrient supply required by the body which lowers the food cravings and hence helps in weight loss further. Chlorella, as mentioned already, helps in removing heavy metals which is a natural detox phase that can promote weight loss. There is evidence that chlorella supplementation can help people going through chemotherapy. Chemotherapy often leads to weakening the immune system with radiations. But it has been found that chlorella reduces these harmful effects. A study showed less respiratory infections and different illnesses. Also, chlorella helps in fighting cancer-causing factors like heavy metals by helping in eliminating them. The doses may differ from person to person. Usually, the recommended dosage of chlorella ranges from 4-8 grams per day. 1. What is Chlorella used for? Chlorella is used as a nutritional supplement for health and medicinal purposes. 2. Can Chlorella help in weight loss? A. Yes, chlorella has been found to be recommended by Nutritionists for weight loss. 3. Which is better chlorella or spirulina? Both Chlorella and Spirulina are considered as superfoods for their amazing nutritional contents. So, both of them can be included in your diet to bring various health benefits. 4. Can Chlorella make you constipated? Yes, it has been found that chlorella can cause constipation. Therefore, you can consult a doctor before going for its daily consumption.